Leadership coach, Susanne Madsen, provides an acronym that can help project leaders structure a coaching conversation. When you coach someone, Susanne said, you’re trying to help them improve their performance, but not through giving them advice. Rather, effective coaching is all about empowering people to find answers for themselves by asking the right questions. G stands for goal – What is the problem you would like to achieve? R stands for reality – What obstacles are currently in your way? O stands for options – What could you do to move yourself just one step forward? W stands for will – What are your next steps, what will you do, and by when? Coaching is not about just having a pleasant conversation. By having a structured strategy such as this, Susanne notes, your success rate is improved. Consider it a bit of coaching advice on how to coach. Take it further: Learn what really motivates people in Susanne’s previous training video. Hi, I’m Susanne Madsen. Welcome to this whiteboard session on coaching with the GROW model. First, we’ll look at what coaching is, and then we’ll examine how the GROW model can help you to structure a coaching conversation. Coaching is essentially a way to help someone move forward. It is not about giving advice. In fact, it’s about empowering someone else to find the answers for themselves by asking insightful questions. The GROW model can help us to structure such a coaching conversation. 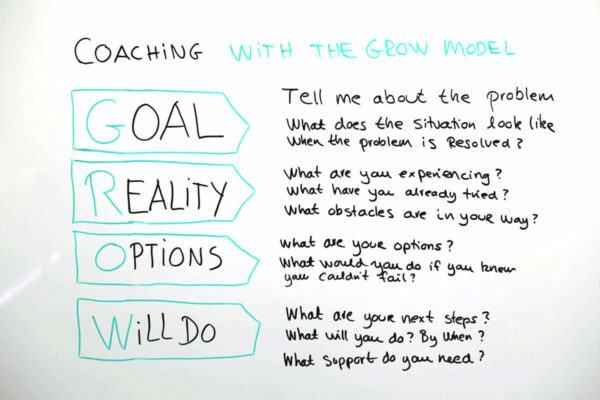 The GROW model is one of the most widely used frameworks in the marketplace for coaching. What does this stand for? G stands for goal. R stands for reality. O stands for options. W stands for will do all the way forward. As you move through your coaching conversation you step through each of these four steps. You start with the goal. You need to understand what we’re talking about here. What is the problem or what would the coachee like to achieve? You ask questions such as, “Tell me about the problem, what does the situation look like when the problem is resolved, or what would you like to achieve?” You’ve got to understand what we’re talking about here. Most of the coaching conversation will happen in reality. As you explore with the coachee what is really going on at the moment, oftentimes the solution may pop out by itself. The coachee will say, “Oh gosh, I never thought of that, now I see what I need to do.” It’s very powerful. You become a sounding board or a mirror to the person you’re coaching. Then, you move on to options. This is essentially where the coach helps the coachee to brainstorm what they could do to move themselves forward. You ask, “What are your options, what could you do to move yourself just one step forward, and what will you do if you knew you couldn’t fail,” is that famous coaching question.